What kind of story do we see in the news just about every day? Incidents of child abuse. 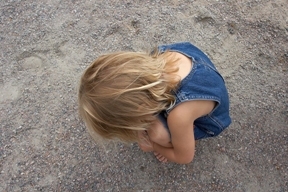 When it comes to child abuse, the statistics in the United States are unnerving. According to the Department of Health and Human Services, in the United States a child is abused or neglected every 36 seconds. This Department also reports that in 2010, “parents, acting alone or with another person, were responsible for 79.2 percent of child abuse or neglect fatalities.” And according to the American Anthropological Association, three to five children a day are killed by their parents. At first it might seem ironic that in our child-centered society so much harm comes to children.There are plenty of wonderful parents, but I bet you’d agree that parenthood is not automatically the right choice for everyone. As these statistics illustrate, you don’t have to look very far to find parents who never should have had children. Why do we see so many people who are unfit to parent? It starts with our belief system around parenthood, which includes pronatalist assumptions that lead everyone to believe they should have children — even people who shouldn’t have them. Pronatalist beliefs also condone the right for anyone to have children whenever they want to have them, which leads many people to have children before they are emotionally, psychologically or financially ready. When this happens, it not only harms children, but comes at great cost to our society. Who pays for the costs of unfit parents and their harmed children? We do. In 2007, Prevent Child Abuse America conservatively estimated the annual costs of child abuse and neglect at $103.8 billion. But there is good news. In our current political climate where bipartisanship seems virtually non-existent, child abuse is an area that stands out as an exception. Recent bipartisan efforts of Senators Susan Collins (R-Maine) and John Kerry (D-Mass.) have resulted in the Protect Our Kids Act, which proposes the development of a national strategy for reducing child abuse. Kerry indicates that the Act will evaluate effectiveness of existing programs designed to “keep children safe from abuse, maltreatment, and neglect.” However, more needs to happen for real change to occur, and it starts with mindset change. Instead of subscribing to pronatalist assumptions that promote irresponsible reproduction, parenthood needs to be treated as a privilege. Despite the pronatalist myth that parenthood is supposed to come naturally — that somehow the ability to give birth has a strong connection to the ability to parent — parenthood also needs to be treated like any “job” that requires certain skills and aptitudes. In our society, driving is a privilege because if we aren’t able to drive well, it will result in harm to others. Because parenthood can potentially cause great harm to children and society, and because it’s arguably the most important job in the world, it’s time we get more serious about holding these same attitudes when it comes to having children. And we need to translate these attitudes to the development of programs, such as nationally mandating high school parenthood education. It exists in some schools, but more often than not it isn’t mandatory, and when it does exist, needs to go further than introducing what’s involved in parenting. At this age, young people need to begin exploring their interest, desire and aptitudes for parenting one day. We need to get more serious about adult parenthood education as well. Mandated educational programs do exist, such as the Parent Accountability Act, which is designed to educate parents of teens convicted of gang crimes. Lots of resources are also out there, but they are largely for parents seeking help once the baby is already on the way, is already here, or when problems already exist. It would be far better to invest resources in programs that are taken before pregnancy occurs to help people assess their readiness on a number of levels, from the financial to the emotional. Developed by experts from a range of disciplines, this kind of program should also be mandated, and designed with serious state and federal incentives, such as tax deductions for completion. No doubt in today’s economic climate, some might initially balk at the costs associated with programs like this. However, cost concerns need to be put against the billions we already pay due to bad parenting and the harm it causes to children. Treating parenthood as a privilege would shift the cost responsibility from dealing with the aftermath of unfit parents to preventing them in the first place. Children deserve parents who are best suited to raise them, and society has a duty to our children to ensure this happens. Creating tangible ways to treat parenthood as a privilege, such as parenthood program directives, has the potential to powerfully execute this duty. It’s time we stop living by pronatalist assumptions that fail to foster a society in which those who are best suited to become parents are the ones who have children, and commit to one that not just promotes, but demands, responsible reproduction for the benefit of all. In the “Right to Reproduce” Assumption chapter of The Baby Matrix I go into this and much more! Good piece. Pro-natalists bleat about how much they care about “the children” but absolutely lose it at the mere suggestion that some people aren’t meant to be parents and really shouldn’t have kids. They start screeching about forced sterilization and China and whatnot. They cannot envision a middle ground between our current state of unrestrained procreation and a hideous dystopia of mandatory abortions and infanticide. There is a legitimate concern that poor people and minorities will be disproportionately targeted by campaigns to discourage parenthood for everyone but that can be addressed. I definitely like the idea of a tax credit for completing parenthood readiness programs. We currently reward people for procreating through the tax code to a shocking degree. A childless adult below the poverty line can get a maximum of about $470 in Earned Income Tax Credit. A single parent can get up to $3000. That’s a massive disparity and EITC was supposed to be aimed at encouraging poor people to work, not to have children, but it has effectively become a program to incentivize parenthood. The child tax credit of $1000 per child per year to middle class families is just an absurdly extravagant giveaway to reward people for breeding. It’s costing us billions and is completely unnecessary. Thanks–our tax code rewards people having children indeed. Nevermind if they are not psychologically, emotionally or financially ready. In The Baby Matrix I also talk about what I call the Offspring Assumption, which includes discussion about why the tax code when it come to parenthood should be just the opposite–why those who do not have biological children of their own, whether by choice or not, or those who adopt should be the ones to get the more tax benefits than those who have biological children –those who adopt getting the biggest tax break…if we valued “biological is best” much less and more highly valued taking care of the children who are already here, the adoption system would become more effective, and so many kids would benefit from that.